The Big Sauble River is a hidden gem in North Western lower Michigan. Big Sauble River is 37 miles long. 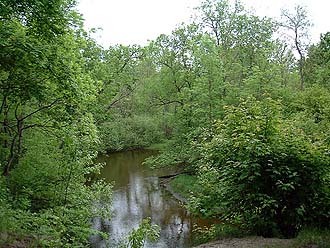 It remains relatively unknown sitting between its more well known brother the Little Manistee and the Pere Marquette. The Big Sauble is a popular destination for brown trout fishing. Its headwaters are at the confluence of the Sauble Lakes (a chain of four lakes) and Bloody-Run Creek The headwaters are easily waded and this tends to be brookie territory, although browns and brookies share most of the river. Continuing into Mason County the river flows into some public land with access available via the labyrinth of two tracks that wander through the area. There is good cover and lots of holes available to fish.